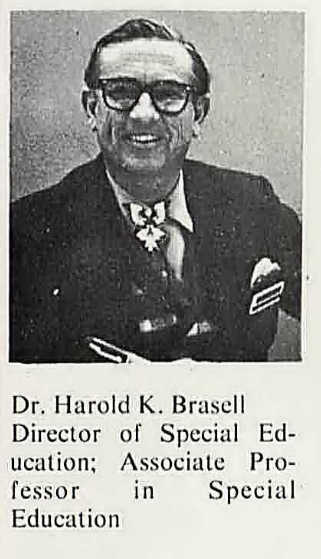 Harold Brasell was born in 1922 in Fort Sumner, New Mexico; his father, Dr. Hugh Brasell, was the town’s physician and surgeon. Harold was more interested in music than medicine; although he attained the rank of Eagle Scout by the time of his graduation from Portales High School in 1940, he spent most of his first year at Eastern New Mexico State College performing with the school’s orchestra, band, Glee Club, and a capella choirs. Brasell left college to join the Navy on October, 1942. He selected medical training, and was instructed at Camp Pendleton in San Diego, California – even becoming an instructor himself by early 1944, carrying the rating of Pharmacist’s Mate, 2nd Class. He was assigned to the field in the fall of 1944, and joined the First Battalion, 24th Marines at Camp Maui. Brasell served in the battle of Iwo Jima as one of the corpsmen for Headquarters Company. He was wounded in action on March 8, 1945, and evacuated aboard the USS Samaritan. After three days at sea, Brasell was deposited at Navy Hospital #926 on Guam, where he received further treatment. He ended up back on Hawaii, on limited service with the Casual Battalion, Transient Center. Brasell finished out the war on Hawaii, and was discharged on December 3, 1945. He received the Bronze Star for his actions on Iwo Jima, as well as the Purple Heart for his wounds. After the war, Harold returned to his studies. He graduated from Eastern New Mexico College in Portales, and went on to earn his doctorate in psychology. Over the course of his career, he taught at universities in Arizona, Colorado, and New Mexico, and became renowned for his work in the field of special education, earning a Presidential Commendation for his pioneering teaching techniques. Dr. Harold Brasell of Eastern New Mexico University, 1971. Doctor Brasell died in 2003, and is buried in Portales Cemetery.